October 1, 2013 – Links International Journal of Socialist Renewal -- The school year should have already begun on the Balearic Islands (Mallorca, Menorca, Ibiza and Formentera, near the eastern coast of the Iberian Peninsula), but it hasn’t. Since September 16, high school and primary teachers have been on an indefinite strike. On September 30, after an earlier mass meeting of the cross-union Teachers’ Assembly voted to stay out, the strike entered its third week. The day before, the Balearic Islands saw their biggest ever demonstrations, when at least 100,000 came out to support the teachers and to protest against the education and language policy of the regional People’s Party (PP) government of Jose Ramon Bauzá and his education minister Joana Maria Camps. The tide of people wearing the green t-shirt of the movement amounted to at least 80,000 in Mallorca, 10,000 in Menorca, 8000 on Ibiza and 500 on Formentera—that is, 10% of the population of the islands. At the same time, 3000 demonstrators filled James Square in central Barcelona to show their support as did protesters in other towns in Catalonia and Valencia. On Mallorca alone, 189 buses had to be hired to bring protesters from outlying districts to Palma, the capital. September 29, with its “green tsunami” of protesters demanding Bauzá’s resignation and withdrawal of the Balearic Islands’ government’s new Integrated Language Procedure (TIL), is already being described in the Balearic media as “the day that will last for years”. In the fortnight since the strike began, up to 6000 teachers have been demonstrating daily outside parliament and government buildings in Palma. When the ceremony marking the start of the Balearic Islands’ university term was held, a swathe of lecturers walked out to express their solidarity with the thousands of teachers protesting outside. What has it taken to drive the teachers to such an extreme ― with no wages and dependent on voluntary contributions to their strike fund? Why do all public sector teachers’ unions support the strike, both the “non-political” professional associations and the “political” unions associated with the major parties ― including the Balearic Island branch of the tame-cat National Association of Teachers of Education (ANPE), viewed as closest to the right-wing People’s Party (PP) that runs the islands’ regional government? Two assaults on education and culture by regional and national PP administration have combined to drive the teachers to such high-stakes action. There are the vandalising cuts to education funding, wages and working conditions, accompanied by the “reform” of the national syllabus by national education minister Jose Ignacio Wert. These assaults have already produced huge stoppages and protests elsewhere in the Spanish state (especially in Madrid, where teacher’s resistance first took the form of a “green tide” of protesters wearing the movement’s emblematic green t-shirt). The Balearic Islands are where the PP axe has cut deepest. Since May 2010, the teachers’ working week has risen from 35 hours to 37.5 hours and their wages have fallen on average by 25%. The 2013-2014 school year is set to start 1000 teachers short (8.3% of the teaching body) for the same enrolment of students, leading to class sizes of over 35. The second factor is the Balearic Islands’ government’s new Integrated Language Procedure (TIL). This downgrades the Balearic variant of Catalan, the language of the islands for 800 years and of its school instruction up until now, into one of three languages to be taught in the education system, along with Castilian (Spanish) and English. This move has turned teacher anger into extreme outrage. It has also roused broad sections of society, progressive and conservative, young and old, to show the huge solidarity revealed by the September 29 demonstrations. Bauzá’s pretext for the move on Catalan’s status as the main language of instruction is the need to make more syllabus time available for teaching in English, portrayed as the passport to “a decent future for our kids”. Further fuelling the fire of teacher fury has been the despotic response of the Bauzá government to any opposition. In July, when three high school headmasters on Menorca simply communicated to the education department the disagreement of their school councils with the proposal, they were suspended. When the education department’s representative on Menorca then resigned in protest, he was replaced by a reliable-looking priest from the ultra-conservative Catholic grouping Opus Dei. However, the curate had to resign before even starting the job because the outrage from big sections of the local Catholic community was so great. Only now has Bauzá been able to find a stooge willing to take the job ― a PP local councillor innocent of any connection with education. On September 5, the timetable for TIL implementation was provisionally suspended by the High Court of Justice of the Balearic Islands on appeal from one of the teaching unions. Bauzá immediately repackaged the timetable as an emergency regulation to sideline the court. The beserk authoritarianism of the Bauzá government reached its high point when it hired an €1800-an-hour helicopter to try to remove a huge solidarity banner that had been placed on a highly visible but remote cliff in northern Mallorca. The helicopter crew had to abandon the mission Bauzá had given them because it was just too dangerous. During the strike high school students supporting the strike have been detained by police (with their identification badges hidden) and had mobile phones confiscated. Staff and students have been threatened with suspension for wearing at school the red-and-yellow bows of the campaign. However, none of this has intimidated the movement―in the schools the students are putting out YouTube videos expressing their hatred of TIL and their solidarity with the teachers, often in songs that cleverly parody recent Catalan hits. TIL has not come out of the blue―it is simply the latest attack of the Bauzá government in its war to reverse the 30 years of gradual consensus-based normalisation of the role of the Catalan language in the Balearic Islands, a recovery after its effective outlawing from public life during the years of the Franco dictatorship (1939-1975). Since he won a majority at the June 2011 regional elections, Bauzá ― who had been preselected within the PP by faking sympathy for its more “Mallorcan” wing ― has been dutifully carrying out a program of de-Catalanisation that was never even hinted at in his election campaign. Bauzá's actions include: eliminating knowledge of Catalan as a requirement of public service employment (described by the University of the Balearic Islands as condemning the language to “progressive eradication” and opposed by all public sector unions); reducing the use of Catalan by the public broadcaster; and closing or defunding a range of cultural institutions. Particularly important was the 2011 upgrading of Castilian as a language of instruction alongside Catalan, and segregating students according to their choice (against all pedagogical advice, including that of the Schools Council of the Balearic Islands). 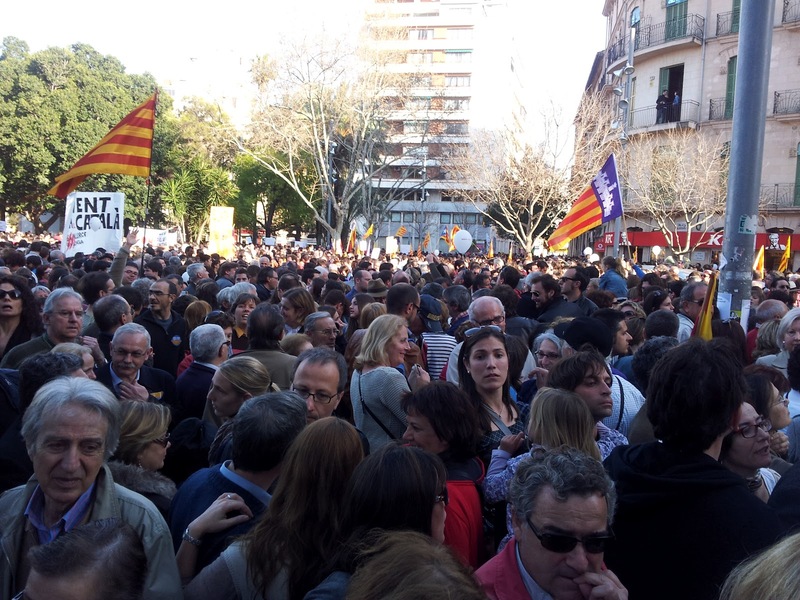 Such moves were enough to enrage tens of thousands, including many PP voters, leading to a 50,000-strong “Yes to Our Language” demonstration in Palma on March 25 last year. The PP-backed counter-demonstration attracted 34. Yet in June this year, Bauzá’s main plan ― to show that, once parents had the choice of having their children schooled in Castilian, enrolment in Catalan education would drop sharply ― flopped miserably. The education ministry claimed that about 70% of parents enrolled their children for Catalan schooling, and 30% for Castilian schooling. However, a thorough survey of primary school enrolment by the main teachers’ union, the Interunion Syndicate of Workers (STEI-i), revealed that the ministry had been lying: enrolments for three- to six-year-olds revealed an 86% to 90.5% preference for schooling in Catalan. Only in a few Catholic schools did the breakdown approach the ministry’s figures, by 71% to 29%. The reaction of the government to that defeat was to press ahead stubbornly with the TIL, avoiding any real consultation with the education community. To introduce a “trilingual” syllabus TIL will reduce the obligatory minimum hours of teaching in Catalan from 50% to 30% or less. Teachers with only basic English will now have to teach subjects like mathematics and ecology in that tongue, “helped” by the most rudimentary of textbooks. What explains this anti-educational madness, which has even led to the resignation of PP office-holders? It is not due to the Balearic Islands’ students’ low level of Castilian ― that’s already better than that of students in several mainland Castilian-only regions. At its heart lies the conservative, neo-Francoist, obsession that Spain, “one and indivisible”, is under threat from the Catalan, Basque and Galician minorities. In particular, every advance for the Catalan identity ― borne along by the burgeoning Catalan independence movement and the spread of Catalan language and culture ― just has to be stopped. Bauzá’s war is thus part of the endless PP-driven moves to force the Catalan government to introduce Castilian as a language of instruction. In the national parliament last week, the PP joined together with the Spanish-centralist Union for Progress and Democracy (UPyD) to pass a law making Castilian the obligatory language of instruction across the Spanish State. That was just another day in the offensive that has also produced grotesque operations like the Aragonese PP government’s decision to redefine the Catalan spoken along the border with Catalonia as the “Aragonese Language Specific to the Eastern Region”. Revealing, on September 29, was the priority given by the PP-dominated national broadcaster, RTVE, to the Balearic Islands biggest-ever protest. The national TV news mentioned it after 28 minutes of more important matters such as the state of king’s health after a recent operation and Spain’s victory in the world championship of hockey on roller skates! At the time of writing, the strike, which began with 90% participation, is holding up well, although participation has been variable. Yet the daily protests show no sign of waning and the members of the Balearic Islands government simply cannot appear in public. All the signs are of a vicious drawn-out fight. The Bauzá government has decided that it must win the confrontation, rejecting all offers of mediation, including by the chancellor of the University of the Balearic Islands. A strong point of the strike is the role of the cross-union Teachers’ Assembly, with group in every school and a website also keeping teachers and the public informed and inoculated against Bauzá’s black propaganda. In recognition of the immense authority of the Teachers’ Assembly, the teaching unions have made places available for its representatives on their negotiating team. A victory for the Balearic Islands’ teachers would reverberate across Spain, show that PP governments can be beaten, and weaken the position of the national PP government. But that victory is no certainty. The teachers’ need all the support they can get (see Appendix 2 for details of how to send solidarity messages and financial support). I am writing from Mallorca. I am a mother to a 12 years old student and the teachers have all my support. The official excuse for the TIL is that children need to know Spanish-Catalan-English equally when they finish school. Of course, we all agree to that, who doesn't? HOWEVER: instead of implementing the idea step by step, preparing both the teachers (investing on to improve their English skills) and children (starting with the youngest), the Government has agreed that a teacher that gets a B2 certificate (I think this would be equivalent to a First Certificate of Cambridge) they can teach Biology, or Maths, or History in English to 12 years old students who have no knowledge of English at all. At the same time the TIL is imposed, schools suffer cuts also in connection with the learning of English (no more native teachers, no more international programs). Isn't that astonishing? People like me who support English learning at school but are against the TIL believe that the result of this politics shall be a disaster for our children: they will learn very poorly the subject in a bad English. I am also a mother of children in Mallorca, and we also support the teachers' strike. What's more, I am an EFL teacher and it concerns me deeply that teachers are being forced to teach a school subject in a language that they have only a limited knowledge of. Let's put this into context: B2 refers to a level of language competency on the Common European Framework of Reference for languages. One descriptor for B2 level is: "Can interact with a degree of fluency and spontaneity that makes regular interaction with native speakers quite possible without strain for either party." This in no way equates to the demands made on a speaker who is addressing a *group* of *students* who are NOT *native* speakers and who do not already have an *understanding of the material* they are covering. This, in a ddition to the fact that we are talking about a classroom situation with all the in-built issues that come with it. However, the teachers' level of English is only a small part of the problem. There has been no government investment in teacher training in this area, there has been no research into the possible effects of such a policy, there has been no public enquiry (I suppose this wasn't really needed: they knew there would be massive opposition, but they didn't care). If a private company has new skills requirements of its employees, the onus is on the employer to provide and pay for training, and compensate the employee for their time. This government expects teaches to improve their language level in their own time, and largely at their own expense* And, we are not talking about a short course in the use of a computer program. One cannot take a 60-hour language course and hope to advance from school leaver level (currently around A2) to the required level. This represents about 200 hours of classroom time!! Depending, of course, on the quality of teaching and learning. The government's solution? They have accepted all applications to study English at the Escola Oficial d'Idiomes (Official Language School), where adults can study (for a low fee) languages in just the way they studied - and failed to learn them - at school: in groups of 30 students, completing grammar exercises, not speaking or using the language. This is not the way to prepare teachers to use a language in their own classroom situation. This does not give a secure practice situation where speakers develop the confidence they need to go out and use the language. This produces yet another piece of paper which proves what this government already knew: learning a language does not require many hours of quality study, immersion in the sounds and culture of that language. Simply attending an over-crowded class for a few hours a week will be enough – afte rall, with the trilingual system, this will be enough for our children to learn Spanish and Catalan as well. Of course, your description of the attack on Catalan presents very clearly the real issue at the heart of this story. But, the strength of the green movement lies in the fact that many people from all sectors of educational society and beyond have come together to defend standards in state education, to demand that policy makers consult with and take notice of international research which shows that learning a language requires immersion, that children learn a foreign language better when they have learned their first language well, and that reforms in education can only be successful when they are supported by those on the front-line: the teachers and parents who have to implement and adhere to those reforms.